UPDATE 6/29/16 11:40p Pacific – ShowBuzzDaily made an error in their initial forecast and published a correction. Thanks to Baby Mama and the Beast for pointing this out. The tables below and analysis have been updated to reflect this change. A week after an “easy” choice for Best Performer in “The Shallows”, the Fantasy Movie League Pricing Gods strike back at us again with another difficult slate of films. Three new releases will get introduced to theaters and the rarity of the Fourth of July falling on a Monday gives us four days worth of revenue to consider. The extra day gives us a little extra math to do, with the typical Monday holiday bringing in another 24% compared to the typical Friday/Saturday/Sunday (what the cool kids call FSS for you new players out there). 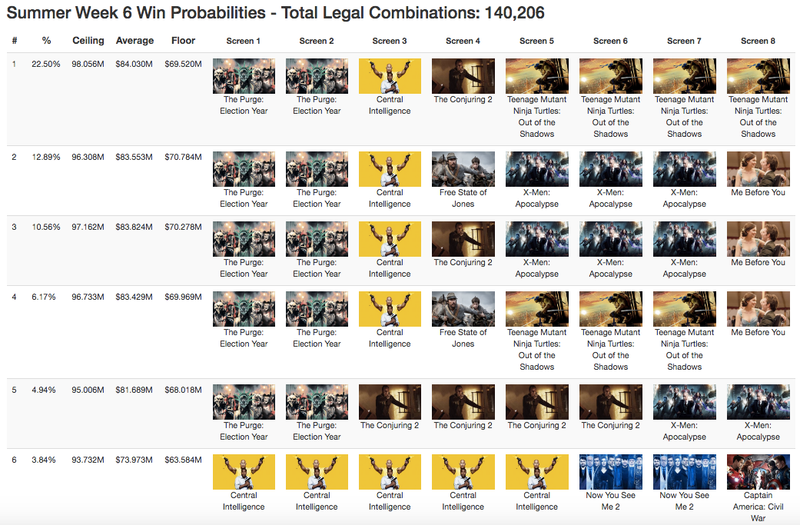 When you average the ProBoxOffice and ShowBuzzDaily forecasts and extrapolate the average value for the non-forecasted films, you get the Use column, the the values I use in my model. For ShowBuzzDaily, they only provided 4 day values for new films, so +24% was added to their 3 day predictions for for returning movies. The Value column divides the Use by the $FB. While I’m showing the top 6 model results above, a record 32 different lineups one at least one of my 729 simulations. That speaks to the variety of filler choices this week, though, as all feature anchors of either “The Purge” x2, “Finding Dory”, or “Central Intelligence” x5. Let’s start by examining “The Purge”, whose $29.25M averaged 4-day forecast extrapolates to a $23.59M 3-day box office take. Lately, we’ve seen sequels do much worse than their originals and the drop from the original “Purge” to its 2014 sequel was 12%. With that $23.59M as a target, the drop from the second in the series to this new version would be 21%, which seems well within range given it is getting better reviews than its predecessors. What Thursday preview number should you look at on Friday morning for “The Purge: Election Day”? If you use that $23.59M number and look up comparisons on the HSXsanity Thursday data set, “Insidious Chapter 3” had a $1.55M Thursday on its way to a $22.7M 3-day opening weekend. So, any Thursday number above $2M would point to “The Purge” but below $1M would lead you other directions. Next up is “Finding Dory”, which dropped more like a traditional Pixar film in its second week last week instead of other $150M openings. If that holds, the comp that is abuzz in The Chatter is “Toy Story 3”, which also had its third week on a holiday weekend and dropped only 27.4%. 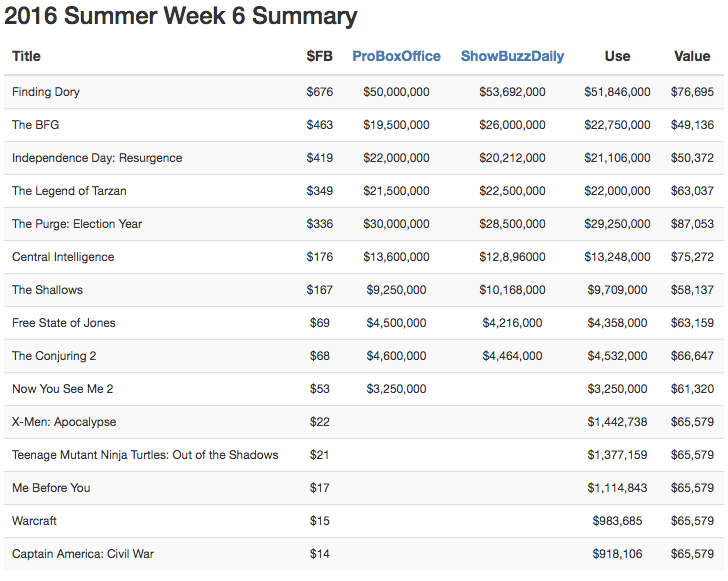 If you apply that same drop percentage to “Dory”, it would bring in just shy of $53M, but still fall short of beating out pro forecasts for “The Purge” for Best Performer. Finally, “Central Intelligence” is forecasted to what equates to just a 29% drop for the equivalent FFS weekend, which seems aggressive for an anchor. Unless the theater count for “Dory” drops significantly and the Thursday number for “The Purge” is poor, I’d stay away from The Rock and Kevin Hart this week.